German and Austrian Jews brought Nobel prizes and Olympic gold medals to their countries. They had fought in their armies, built businesses and raised families. When the war broke out, they found out that it had all been for naught. 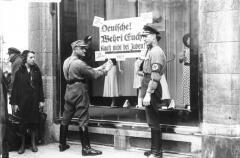 The November pogrom against Jewish citizens throughout Germany and Austria in 1938, infamously known as "Kristallnacht" was a turning point in history. The pogroms marked a dramatic intensification of Nazi anti-Jewish policy that would soon culminate in the Holocaust: the systematic, state-sponsored murder of the Jews of Europe. Jewish-owned stores, community centers, and homes were plundered and destroyed during the pogroms. Encouraged by the Nazi regime, the rioters burned or destroyed 267 synagogues, vandalized or looted 7,500 Jewish businesses, and killed at least 91 Jewish people. They also damaged many Jewish cemeteries, hospitals, schools, and homes as police and fire brigades stood aside. On this page, fifteen of Centropa's Austrian interviewees, remember this night and the consequences it had for their families.